Published as a quarterly broadsheet in Brooklyn and distributed in New York, Chicago and Mankato, The Wax Paper has all the bluff of newspapers before they shrank into tabloids. Eight arm-stretching pages is enough to keep you reading happily for more than an hour. So I’m delighted, they accepted two of my short plays for publication in Volume Two (Issue One) alongside some powerful short stories, arresting photography and excellent poems. Poets may have a hard time getting published, but playwrights are competing for even fewer print opportunities. Double bravo therefore to The Wax Paper for giving over an entire page to my two dramas. Lost Property has been performed a number of times, most recently at The Lost Theatre’s Five Minute Play Festival (see photo to the right with actors David Bevan and Maria Askew). Bathroom Secrets is a 10 minute play, most recently performed at Unheard, a Festival run by Goblin Baby Theatre Co. at The Bread & Roses Theatre in Clapham. On the left you can see actors Susan Hodgetts and Mark Lisseman in full flow as a married couple who can’t communicate. This issue of The Wax Paper contains poetry by the flamboyantly named Richard King Perkins II, Holly Wren Spaulding, Charles Rafferty, Robbie Gamble, Talal Alyan, Jennie Greensfelder and George Eklund. Two of the short stories are absolutely knock out: The Gods by Melissa Knox is a fascinating critique of a life under Freudian analysis. The Second to Last Supper by Sabrina Harris, is a brilliantly satirical attack on capital punishment using the absurd (and I believe legally correct) premise that a United States prisoner cannot be executed unless they have been given their last meal request in full. 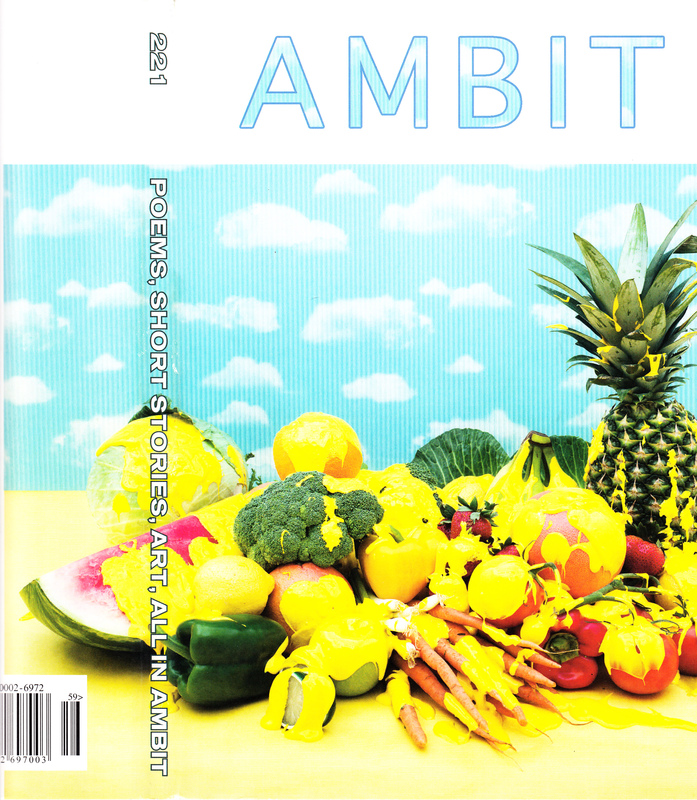 Ambit is looking absolutely luscious this summer – a splash of fruit and veg on ethereal blue and inside some wonderful reading. Poems in this issue include work by former Poet Laureate Andrew Motion, Sarah Howe, Richard Scott, Declan Ryan, Claire Booker, Malene Engelund, Sally Festing and Robert Selby. Artwork is on top form, with cover and a palate of work by South Korean artist Hyounsang Yoo, who gives insights into her journey as an artist and her working process. The Summer Salon of images is refreshingly diverse, including ‘Cherries’ by Kes Richardson and ‘Fatal Flower Garden’ by Melanie Bonajo. And as an added extra, Jenny Dunseath’s ‘An image, I’m pleased, I am sad’ is available to download from Ambit’s website as an animated .gif. Plus short fiction lovers can enjoy stories by Dave Wakely, Marcella O’Connor, Tania Hershman and Jonny Keyworth – from insights into scientific nuns and gay parenthood to the melting pot of cultures that is New York.